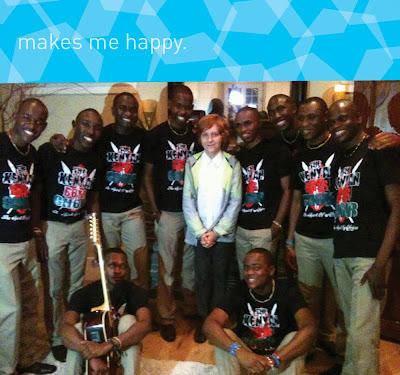 Above is Spud with the Kenyan Boys Choir after a beautiful performance at a Me to We event supporting Free the Children. So grateful Spud and I could both be present at this super inspiring event. Also did a little shopping! For a great cause! Check it out. Welcome to Makes Me Happy Wednesdays. Why not celebrate hump day with a little happiness? A photo. A Caption. A smile. The stuff life is made of.